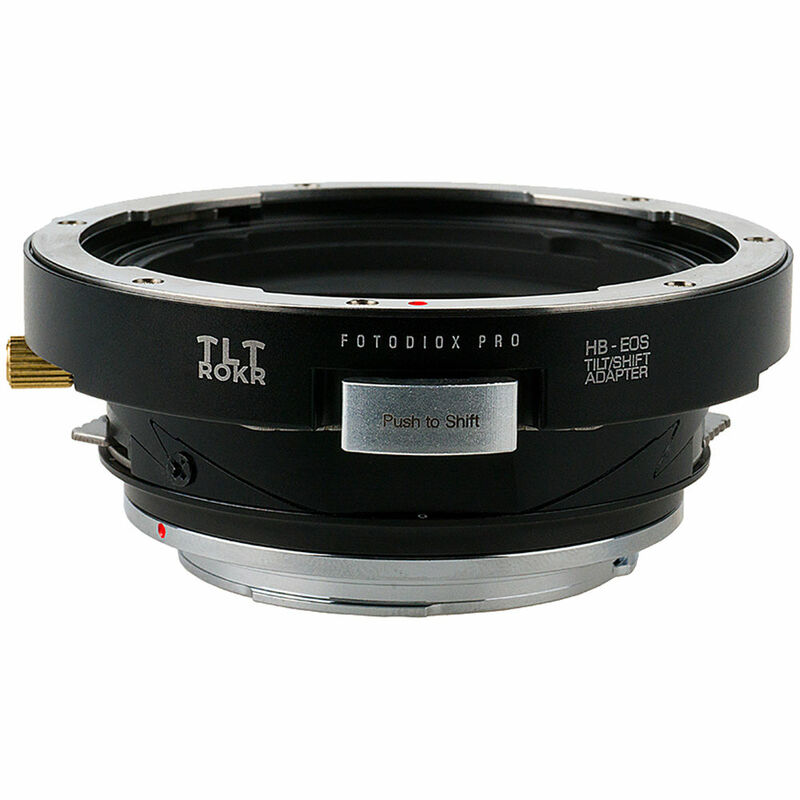 This FotodioX Pro TLT ROKR Tilt-Shift Lens Mount Adapter allows a Hasselblad V-mount lens to be used with a Canon EF or EF-S-mount camera. Tilt, shift, and rotational capability is provided to help ensure correct convergence of lines within your frame, or to achieve selective focus effects, making this adapter useful for architecture, product, and macro photography. This adapter also complements panoramic stitching with or without a panoramic tripod head, allowing for more precise capture of individual composite images so that can be more easily and accurately stitched. The shift function provided by this Pro TLT ROKR Tilt-Shift Lens Mount Adapter enables movement of a lens's optical axis by +/- 10mm from its center, while the tilt function allows the plane of focus to be adjusted by 10mm in one direction. Clockwise or counterclockwise 360° rotation is also enabled to control the direction of tilt and so that the shift function can be performed at any rotational angle parallel to the camera it is installed on. Tilt, shift, and rotational movements can be carried out simultaneously or independently of each other, and in either case with a smooth, click-less action. A Generation v10 chip built into the adapter enables focus confirmation within a Canon EF or EF-S-mount camera when used with a Hasselblad V-mount lens. This feature allows focus to be quickly and accurately achieved through a compatible camera's viewfinder or live view feature following any adjustments to the position of the lens using adapter.